Are you looking for a new inspiration? 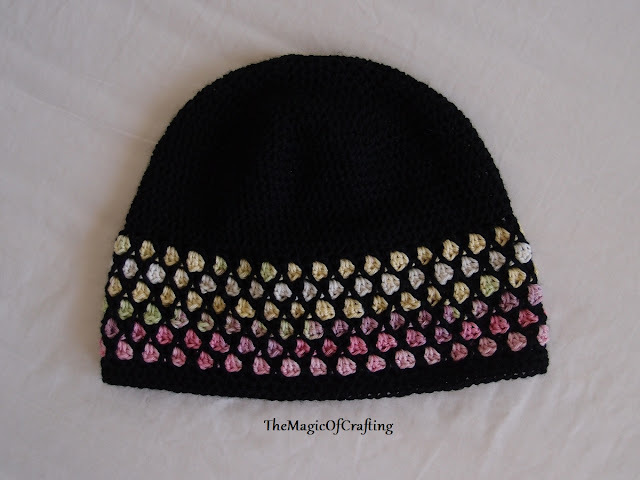 Try to play with different colours of this stylish coloured hat pattern to get completely different look. This pattern may look complicated at first sight but it is actually quite easy once you understand it. Only basic stitches are used. 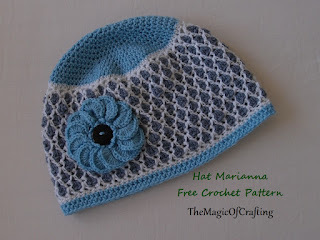 To adjust the size follow the instructions in the pattern. I am very happy with how this hat turned out as this is something I always had on my mind but never could make it. 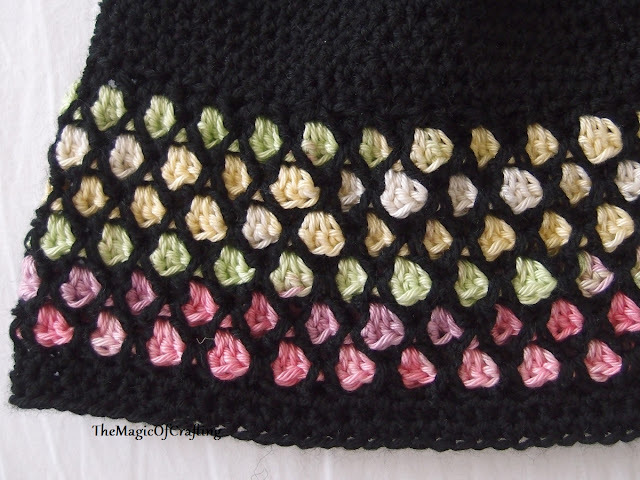 If you are just learning this stitch pattern do not do it with black yarn! I've learned it the hard way, lol. Round 1: In mc ch1, hdc 7, ss in ch1 (8 st). Round 13 - 24: Ch 1, hdc in the same st, hdc in each st around, ss in ch 1. 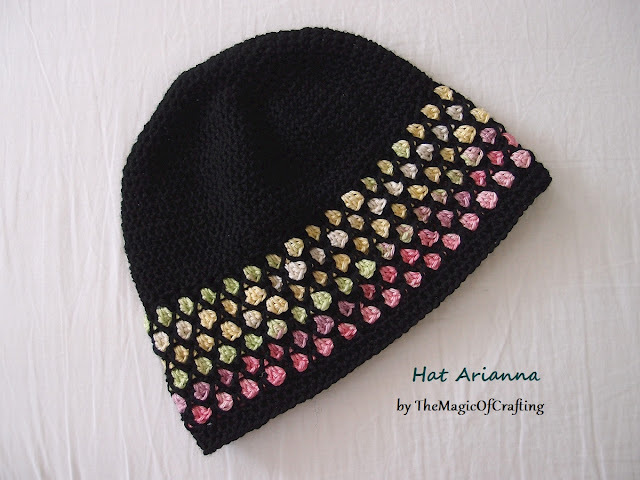 The hat should be around 5in(12.5cm) long and the number of stitches should be multiple of 3. If this is not the case then add 1-2 st in the last row you made so the it is multiple of 3. Round 25: Ch 4, dc in same st. Skip 2st, * [dc, ch, dc] in the same st, skip 2 st*. Repeat * - * around, end with ss in the top of the starting chain. Put a marker in the last worked st and remove the hook. Round 26 [Coloured round]: Join new colour (multicolored yarn) in the ch space between the last two dc from the previous round. Ch 3 (counts as dc), 2 dc in the same st, * work 3dc (cluster) in the next chain space*, repeat * - * till the end. SS in the top of the ch 3 from the start of the round. Put the stitch marker here and remove the hook. Continue the next row with black yarn. Round 27 [Black round]: With the hook draw the black loop (from the last worked black stitch where the marker was) so it is between two clusters of 3 dc from the coloured row and ch 4, dc in the same st. Skip the next coloured cluster from the previous row, * [dc, ch, dc] between the clusters of 3 dc from the previous row, skip the next cluster *. Repeat * - * till the end of the round, end with ss in the starting chain. Work only in the black stitches from the previous black round. Get the marker from the last worked stitch of the coloured row and put it here. Continue next row with the coloured yarn. Round 28 [Coloured round]: With the hook draw the colored loop from the last worked coloured round so it is in the space between 2 dc of the black round. 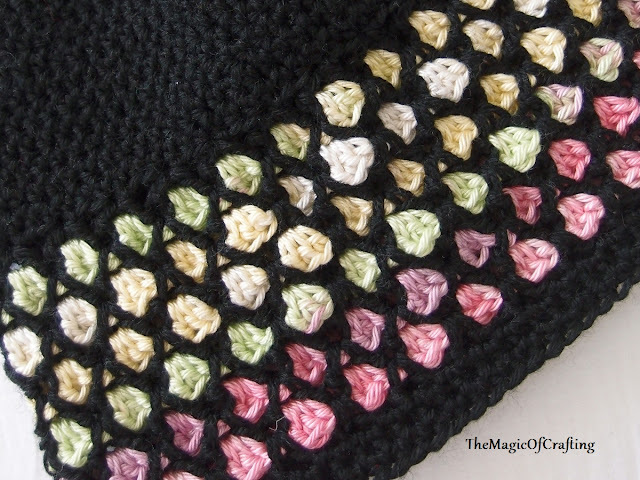 Insert the hook in the colored yarn and continue this row with coloured yarn. Ch 3, 2 dc in the same space. *Skip to the next chain space and work 3 dc*, repeat * - * till the end of the round, ss in the top of the ch 3 from the start of the row. Put the stitch marker here and continue working with black. Round 29, 31, 33, 35, 37: Repeat round 27. Round 30, 32, 34, 36: Repeat round 28. If you need to increase the length continue with few more repeats of round 27 and 28. Round 38: Continue with black. Ch 1, hdc in the same st, now work 1 hdc in each st, 1 hdc in the ch space between the dc. You should end up with 96 hdc (or the same number of stitches when you joined white for the first time). Round 39, 40: Ch 1, hdc in the same st, hdc in each st around, ss in ch 1.